Ocean-based renewables are destined to be a huge piece of a future carbon-free energy system—tidal, wave, and offshore wind are all likely to become more technologically and economically viable over the coming decade or two. As these offshore renewables mature, they will reduce the current pressure to site wind farms in more populated areas closer to urban electricity load centers. Watching the decade-long struggle in Massachusetts to build Cape Wind, the nation’s first offshore wind farm, researchers and state officials in Maine have chosen a different path: they decided to tackle the engineering challenges of building turbines that can float in deep water far offshore, rather than the social challenges of building wind farms in shallow water close to shore (which use fundamentally the same foundation designs as onshore turbines). Floating deepwater turbines can take advantage of even stronger, more consistent winds than their nearshore counterparts; along most of the east coast, offshore wind is far more reliable than onshore locations. UPDATE, 5/9/13: University of Maine researchers unveiled their 1/8 scale floating turbine foundation. See article and video here. UPDATE, 7/12/13: Late-session political maneuvering in the Maine state legislature has led Statoil to put a hold on its plans for floating offshore development in the state. Governor Paul LaPage, a vocal critic of Statoil’s plans, vetoed an energy bill and in order to move it forward, demanded that an existing contract with Statoil be temporarily shelved to allow the University of Maine to file a bid as well. LaPage and other fiscal conservatives have objected to the contract approved by the state PUC, which pays Statoil a higher rate than other Maine electricity sources (the logic being that this small surcharge now will lay the groundwork for a new job base in the state as offshore industrial wind matures over the coming couple of decades). The Statoil contract approved by the PUC uses up all the state incentives that have been approved for offshore wind in Maine. It’s unclear whether the UMaine team wants to submit a bid; many see long-term cooperation between Statoil and UMaine researchers as the more fruitful way forward. An ideal scenario may find both projects getting contracts from the PUC, and thus be able to compete for some upcoming federal incentives for offshore wind development. In any case, the bill only holds up the commitment to Statoil for a few months, so the company’s sudden announcement of a hiatus may be more posturing than a fatal blow to Maine’s ambitious offshore vision. Local coverage here, here, and here. MAJOR UPDATE, 11/7/13: Since July, Statoil has definitively abandoned its project in Maine, citing political uncertainty that agreements will be upheld, and the University of Maine has released its plan, which aims to develop a 12MW pilot floating turbine project in the next few years, with the long-term goal of 500MW of deep water turbines by 2030, generating power at ten cents or less per kilowatt. Here’s the latest. Floating turbines cost less to install than conventional tower-based designs. They can be assembled onshore and then towed out to the installation site, eliminating the expensive and arduous process of building them out in the open ocean. On the flip side, the huge amount of steel needed to make turbines sturdy and heavy enough to withstand rough waves is too expensive. Engineers are working on solutions to get around that, such as intelligent systems that pump ballast water from one tank to the next as a way to stabilize turbines. One thing that’s clear is the need for specialized turbine blades that can produce energy even as they rock and tilt on ocean waves. All that motion means more wear and tear and can also interfere with power generation. For now, all these designs are performing well, the question is more about which can be produced reliably at the lowest cost. There has been some local resistance in Maine, especially about the power purchase agreements between Statoil and Central Maine Power for the energy from the pilot project near Boothbay Harbor, for which Maine’s electricity customers will be paying a premium. State officials maintain that the small extra cost is a worthwhile investment in an offshore wind industry that could pay huge dividends in manufacturing and construction jobs in the years to come. This is also a long-term investment in an electricity-generating future that can wean us from fossil fuels. While Maine’s electricity is already relatively climate-friendly, thanks to significant hydroelectric resources, the development of floating offshore wind in the Gulf of Maine could send lots of clean electricity to Boston and other New England cities. Onshore wind in the Maine hills faces significant resistance as well, with locals feeling that the price paid by industrializing ridgetops and building new transmission corridors is not worth the modest benefit in green energy for neighboring states; the much smaller impacts of offshore wind may change that cost-benefit equation. 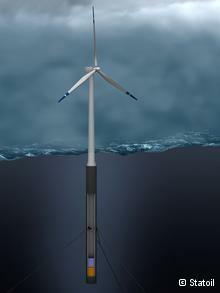 First, though, floating turbines will have to prove themselves durable, and the materials cost must be trimmed. While that research is underway, offshore wind planners will need to insure that wind farm locations don’t interfere with key fishing habitat. Thank you for this informative article. This exemplifies why Maine was voted most peaceful state in the US by the Institute for Economics and Peace.